It's Saturday night again. The week flew by! But this is another weekend for me to try and make a nice meal and create a nice family dinner. Tonight we had medium rare London Broil, avocado salsa (don't get excited...it's basically just chunky guacamole. haha. But it's awesome with steak! ), homemade mashed potatoes, and steamed broccoli. Sometimes I try and keep Chloe out of the kitchen when I'm cooking because the oven is on or I'm doing too many things. Many of you moms know this is not always possible. Tonight was one of those days. She started crying and wanting to come in. She got so upset, so when she finally did come in, she just wanted to be held. I was making mashed potatoes and wasn't sure how I'd finish with only one hand. I pulled over a small stool, threw the rest of the ingredients in the bowl, and put the bowl on the stool. I told her to help me cook. "Cook. I cook," she told me, as she put her hand above mine on the spoon. I slowly mixed the potatoes in the bowl and watched her start to smile. We did this a few more times. She took the spoon out a couple times, and some potatoes went flying, but it was nothing major. Plenty left! After a few minutes, I gave her a taste. "MMMmmmm." She expresses pleasure when she likes food these days. She makes a yummy noise. It always reminds me of the dessert scene from Young Frankenstein. lol. She's too cute. I made up her dinner plate, giving her a small scoop of potatoes she cooked, and she ate it all! I even gave her a second helping and she ate that too. The whole time she kept making all different mmmmm sounds and telling my husband she cooked the potatoes. It was so cute! I couldn't help but wonder if she ate it all because she cooked it and knew that, or did she eat it all because they really were delicious? (I'll admit, they were pretty awesome tonight.) I guess there really is something to having kids help you cook in the kitchen because they are more apt to eat what they create. What a great slice! Your daughter sounds like a cutie! 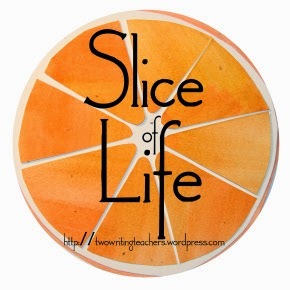 And how great that you are seeing life through new eyes because of slicing! Pretty amazing! This challenge has been absolutely amazing. And the truth is, we never really have a shortage of things to write about. Thanks for reading! Your post reminded me of cooking with my Mom. Thank you for sharing this fantastic slice! Aw, I'm so glad! I'm sure you have some wonderful memories. Thanks for reading!